These two are not friends. They are even less friendly when worksets are involved. 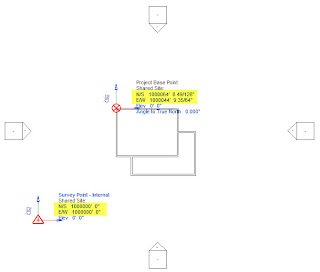 In earlier releases the project base point and survey point were assigned to Workset1 (2012 and older). In a post some time ago I mentioned a support issue that IDEATE's techs encountered where a user assigned them to a different workset and eventually deleted that workst. It resulted in unpleasant crashing. If you look closely in 2013 and 2014 you'll find they are assigned to a workset called Project Info and we can't change that anymore. Unfortunately the more mundane information like the project name, number, issue date, client name and address and many more are also Project Info. 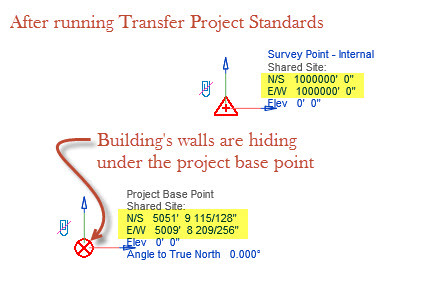 When we use Transfer Project Standards hoping to share the same mundane project info with related linked project files (seems a reasonable expectation) Revit wants to transfer project base point and survey point information too. 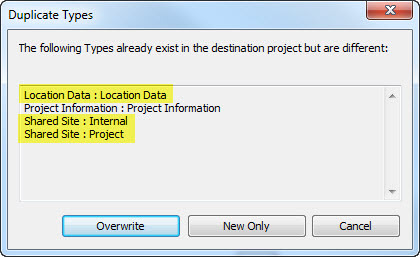 You'll get this dialog when you fire up Transfer Project Standards (TPS). This is what my dummy project looks like before using TPS, note the Survey Point's coordinate values and position. Here's what it looks like after TPS is done. The project base point and survey point have reversed their orientation to one another and they are very far apart now (I zoomed in closer though), far enough that the walls are tiny and hiding under the project base point icon. If two files are already sharing coordinates they aren't immune to this "feature" either. 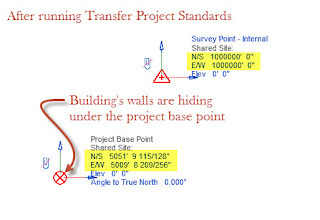 In my testing I find that the coordinates still get messed up if I use Transfer Project Standards and Overwrite in order to pass along the other project information. 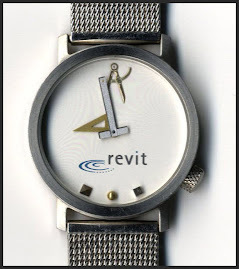 It appears that the safest thing to do once Shared Coordinates are established is... DON'T Transfer Project Standards AND leave Project Info selected. I think that the Project Base Point and Survey Point should be more isolated so they have their own Project Setting based workset, not shared with other Project Info. I'm glad they made it harder (impossible) to reassign them to a different workset to eliminate the other problem I mentioned earlier but they've introduced a new quirk as a result. I find it mildly amusing that Transfer Project Standards acronym is TPS...reports anyone? 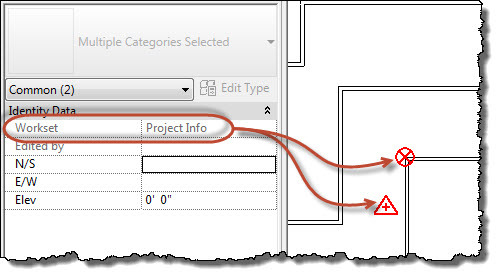 This tip is helpful, but this even more complex when we deal with linked file to MEP in work shared. Thanks for this post Steve. I didn't realize these moved to Project Info and I completely agree with you that they should be on their own workset. I would also say that if possible, that workset should be off by default when using TPS as I think this is seldom desirable (after all, the very nature of Shared Coordinates is to give us the ability to re-position origins for linking and coordinates/elevation reporting purposes, so rarely would these be in the same spot relative to the fixed origin between different model files!). The reason I did not realize they moved to this workset is because most of my interaction with shared coordinates I've been having are in projects started in 2012 (or older templates) and upgraded to 2013 and soon to 2014. 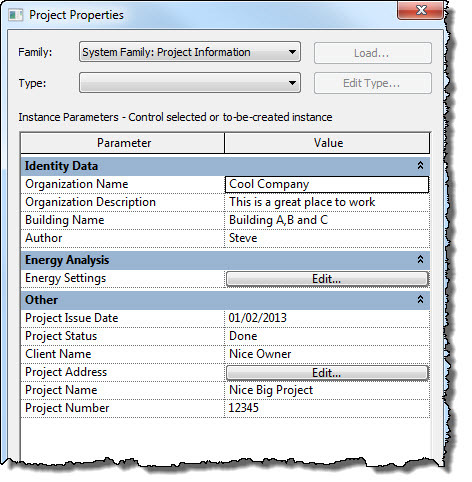 In these, the project & survey points are not assigned to Project Info. but are still on Workset 1 (read-only). I just tested again to be sure and only projects started with a 2013 or 2014 template act the way you describe. 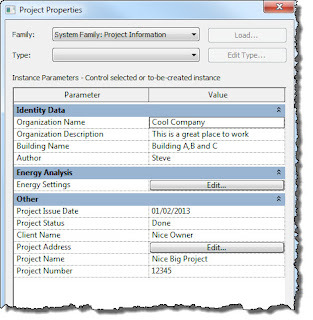 Okay, so what do you do if you have already transferred project standards? 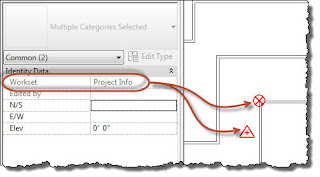 You'll have to check your project and linked project files and re-establish the shared coordinate relationship between them. Thanks Chris...and sorry to hear it. 2019. Just happened on my project.